Engineering and planning is the foundation for all that follows. So selecting the right design firm matters. It matters because you need a business that has a firm understanding of the conditions, the issues, the solutions and timelines. With more than 60 years of experience, this is Nasland. Nasland has a well-deserved reputation for prompt, dependable and efficient service. Our company is proud of our standing as an organization that guides you through the processes and stands by its work. We are there for you from the start, over the course of the project, at the conclusion… and beyond. We have the size to undertake complex and demanding assignments, yet we’re also an intimate family run enterprise with hands-on service – answering your calls, and assisting you, quickly and completely. The Nasland team has amassed a heritage of award-winning accomplishments. We have attracted and retained some of the region’s most demanding clients, including large development firms, numerous agencies and municipalities. If you want a firm that gets your project started on the right foot, a firm that has been there and will be here in the future, a firm that knows the regulations, the regulators, and the terrain, then consider Nasland. Because it matters. It matters because Nasland is a family owned company with more than 60 years of high performance and dependable service in one of the nation’s most challenging engineering environments. We embody a terrific blend of efficient contemporary technologies, and dedicated, enthusiastic and accomplished professionals. Nasland has earned a reputation for sound strategies, responsible recommendations and attention to detail. Nasland Engineering was founded in 1959 in San Diego by Don Nasland. 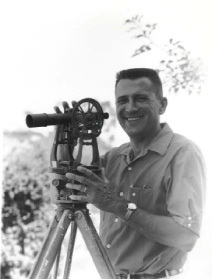 It began as a small land-surveying business and then over time grew to include other related services. Today, Nasland Engineering is a full-service civil engineering, surveying and land-planning firm serving all of Southern California. Nasland is especially proud of its longtime success in Southern California, and its contributions to some of the area’s most unique and notable projects. For more than 60 years Nasland has provided high quality service to a wide range of clients and, in return, our clients hire us again and again. There is no greater endorsement.